(mis)adventures of spindlerose: Stuck. Or maybe finally unstuck. Stuck. Or maybe finally unstuck. Sometimes the muse leaves. Sometimes, my knitting and spinning mojo vanishes for months at a time. During those times, the blog goes silent, the demons of doubt lurk in my head, and I wonder why I keep sending money to Typepad. Writers block (or knitters block or whatever block) happens to all creative people at times. As a writer, I've always felt like I'm in a perpetual state of block with glimpses of inspriation. When that inspriation strikes, I write well. I love the joy when the words flow effortlessly and my inner perfectionist editor is briefly silent. I just wish it happened more often. The first 10 days of NaBloPoMo has reminded me that I need to write more. I need to practice this craft just like I practice knitting, spinning, and cooking. As Laurie said the other day, this (daily blogging) is getting harder and harder. Will it get easier with more daily practice? I added the picture to spruce up the blank wall of text. And because it reminds me that inspriation is everywhere if I open my eyes. 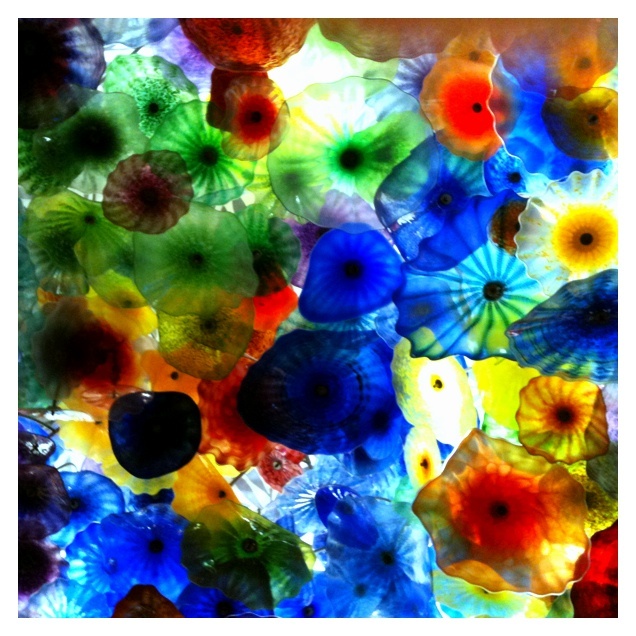 The first time I saw the Chihuli installation in the lobby of the Bellagio, I had to pull out my pocket camera (my iPhone), take a picture, and share it because the colors and textures stunned me. Looking at the picture again brings back clarity I felt when I framed, snapped, and cropped the picture nearly 4 years ago. To be honest, I've been stuck creatively for the past few years. Three moves in 30 months would do that to anyone. It hurts because creating and making is central to my sense of self, so I lose part of myself when I'm not actively creating. Work has been challenging. Most of my daily brain has been dedicated to doing my job. There hasn't been enough juice left at the end of the day to knit a simple sock or scarf. Writing, designing, or even planning something challenging has been beyond me. It's been even longer since I've felt truly inspired to write. I do sometimes write when I'm stuck on an airplane. In rushing from here to there in a metal tube, I relish the unplugged silence that helps me plug in to my own voice. I have a few drafts of essays meant for the blog lurking on my computer, my iPad and in my notebooks that flowed into that silence. By the time I land and life pushes back in, I forget that I had a great idea for a post. I haven't reviewed or considered publishing on any of those, but maybe I should. I do have to write 18 more posts this month. I don't have a good answer for getting through creative blocks. Open your eyes to inspiration. Get enough sleep. Keep practicing whatever it is that you do. Eventually, something good will shake loose. This post brought to you by today's NaBloPoMo prompt. I opened my eyes to the inspriation in my inbox this morning. It prompted something good, or at least something better. Back 20 years ago, when I had just separated from my now ex-husband, I felt beaten down to nothingness. At the time I was a quilter (and quilting led me to my divorce, but that's another story). To cope with feeling beaten down, I started making the simplest quilts I could think of - 2 feet by 2 feet, a variant on the traditional nine-patch design - over and over, just playing with color and the prints on the fabrics. I think I made eight tops in all. By top #3 or so, I could look at them and say, huh, it's clear I am a good quiltmaker, and just that helped my self-esteem enormously. So I say to you: knit garter stitch or stockinette squares from stash. Spin the nicest fiber in your stash, just to spin, Just make the simplest thing you can think of, and it will help. I promise. That picture is beautiful. Thanks for brightening my day with it. I've felt like you do. Not currently, as I have almost too much time for making and writing that used to be filled with active pursuits. Waiting for the muse to strike was hugely ineffective and resulted in years of not-making, not-writing. But at that time I was unaware (or inattentive) to how much of myself I'd lose by giving up these things. You, at least, have not fallen into that slumber. Good for you. Do what you can. I agree with Lynn. Simple comfort spin. Simple garter or st st stitch. The product is secondary. You need to keep skin in this game.